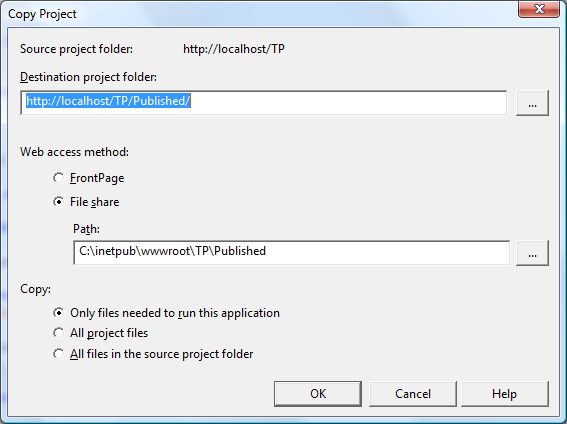 If you’ve used later versions of Visual Studio for creating web applications, you will know that there is an option to ‘Publish’ your application which allows you to compile your application into only files needed to run the application (a good practice to use when putting your application online). When it comes to Visual Studio 2003, there isn’t such an option but the functionality is still there, just masquerading under a different menu option! When you have your project open, build it in ‘Release’ mode (it is not essential that it is built in ‘Release’ mode but I find there are performance improvements over building it in ‘Debug’ mode). 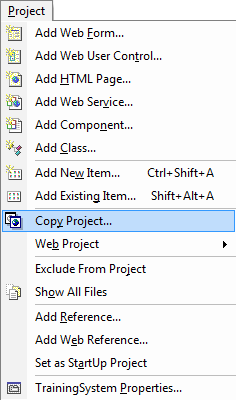 Now select ‘Copy Project’ from the ‘Project’ menu along the top. Here you give it a destination project folder (in my case, the same as the source project folder, but to a folder called ‘Published’), and a web access method. I choose to publish it to my local file system, and then upload it myself. You then choose to copy ‘Only files needed to run this application’ and click ‘OK’. If you now go to the folder which you chose in the ‘File Share’ path, you will have all the files you need to upload to put your web application online, the same as if you had ‘Published’ a web application in a later version of Visual Studio.